Officials in Mexico say they have exhumed the remains of one of the parents of a drug cartel leader killed on 7 October by the security forces. The authorities hope that DNA tests will convince the public that the man shot dead by Mexican marines was Zetas cartel boss Heriberto Lazcano. His body was stolen from a mortuary hours after his killing, prompting speculation that he is still alive. 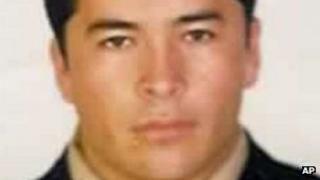 The authorities said fingerprints and photos confirmed Lazcano's identity. The exhumation was carried out at a cemetery just outside the city of Pachuca in central Hidalgo state. It was not clear whether the bodies of both parents had been exhumed. Last week, the head of Mexico's organised crime unit, Cuitlahuac Salinas, said they had decided to request permission to exhume the bodies of Lazcano's parents after failing to obtain DNA material from his sisters. Lazcano, known as "The Executioner", was a founder of Los Zetas which has been involved in a string of mass killings and kidnappings. Officials said his body was whisked away from a funeral home by gunmen hours after a gun battle in the northern region of Progreso, Coahuila state. The navy said it was not until after his body and that of another gang member were stolen that officials realised from pictures and fingerprints they had killed one of the country's most feared drug lords. Correspondents say the theft of the corpse has been an embarrassment for the government and military.